I love spring. It makes me happy and hopeful. The trees are blooming and spring bulbs are popping up everywhere. I don't mind the rain, sunshine, and rain again (and snow) - all in the some hour - it keeps it interesting. Definitely time for a Spring Cleaning Sale! Starts Monday, March 26th and runs through Saturday, March 30th. 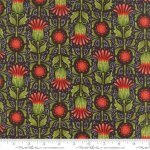 There will be 5-yard fabric bundles, perfect for backings, just $20. All single, ready to go fat quarters will be $1.50 each. 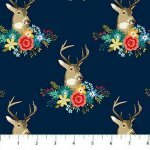 Clearance fabrics will be $6 per yard. There will be patterns, books, samples, and things I don't know about yet, marked to move. 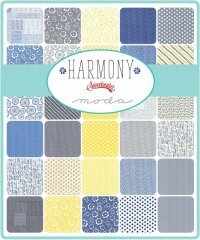 One of my favorite new fabrics is Harmony. The blue, gray and yellow color scheme is crisp and the print scale makes these fabrics very useful. Our selection of wide backing fabrics has grown to over 150 bolts and ready to go pre-cut backs. There are 108/110 wide cottons, flannels & batiks. 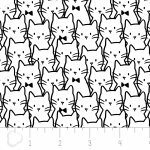 Also, 90" wide Cuddle / Minkee is now in stock. 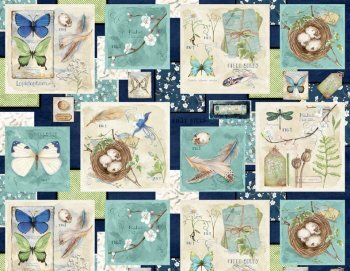 Wide fabrics are not just for backings, with our selection and quality, you may find just the right border (no piecing needed) or a fabric that is perfect for a background. 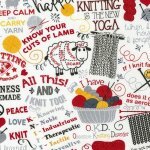 There are only two spots left in the Ditty Bag class, March 31st. There are so many uses for this smart bag that comes in three sizes! An excellent gift, they are fast to make - make a few to have ready for any occasion. The Ditty Bag is part of our "Let's Get Organized" series. Next month we will be making project bags.